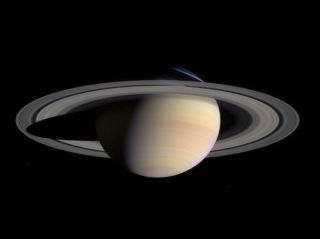 The formation of Saturn's rings is but one of the planet's many mysteries. They look solid, but they're made of particles, mostly dirty ice, from small grains to big boulders. Highresolution observations of Saturn's radio emissions have just been made publicby NASA; these observations were made with the radio and plasma wave instrumentaboard the Cassini spacecraft. The short sound sample released on NASA's website wascompressed, so the twenty-seven minute recording plays back in justseventy-three seconds. The frequencies of these emissions are outside the humanaudio frequency range and have been shifted downward by a factor of 44 (see diagram at right). Take a moment to go to NASA'sSaturn radio emissions page; select the "click here" link at thestart of the article on their page to listen to the short sound clip. Now, listen to the first few moments of this short excerptfrom the classic 1956 science fiction movie Forbidden Planet (click here. ).The similarities are startling. The soundtrack for the movie was created by Louis and BebeBarron. The film represents the first instance in which a movie was scoredentirely with electronic music. Louis Barron constructed electronic circuitsthat generated the sounds; most of the tonalities were generated using a ringmodulator. In creating the electronic circuits, Barron used the equations in NorbertWeiner's 1948 book Cybernetics: Or, Controland Communication in the Animal and the Machine. If you are interested in other musical interpretations ofsolar system phenomena, read about SolarUltrasound – Bass Note In Music Of The Spheres. If you enjoy poster art, you might want to compare theclassic 1956 poster art of Forbidden Planet with NASA's cutting edge Soundsfrom Saturn poster – click here.Listen to more sounds of Saturn at NASA.Listen to more sounds of Forbidden Planet by checking out the soundtrackavailable at Amazon; click here and then scroll down to listen to excerpts.